In the video game world, competition never ceases, and to remain a contender, each console manufacturer needs to maintain an identity among consumers and offer them something they can’t get on any other platform. This weekend, TGR will take an in-depth look at the games — one key franchise for each company — that make Nintendo, Microsoft, and Sony what they are today. Microsoft is fairly new to the home console business; the original Xbox, released in 2001, was their first attempt at a console after primarily being a PC gaming platform publisher. Considering their short time in the business they have certainly made some big strides. The original Xbox sold over 22 million units until Microsoft cut off support due to the launch of the Xbox 360, which has since managed to sell close to 28 million units, overlapping the original Xbox in a shorter period of time and still going very strong. One thing is a fact though: Microsoft wouldn’t be where they are now if it wasn’t for the software, and boy, do they have some monster hits. In the past, when you thought of Xbox you instantly thought of first-person shooters, which were in abundance on the console. Nowadays though, Microsoft has gone out of its way to distinguish itself from that demographic and has really pushed the envelope to bring a wide variety of different genres to the Xbox 360’s software library. In our eyes they were successful in their mission, but what exactly is Microsoft’s most important game/games? When you think of the PlayStation you automatically think of Metal Gear and God of War, when you think of Nintendo you automatically think of Mario and Zelda, and when you think of the Xbox, one game stands above the rest, a game so big it caused mass hysteria for every single release. Before we get to that, though, let’s look at some other contenders for the Xbox crown. There have been some great games that have graced both consoles; Splinter Cell, Crimson Skies, Project Gothem Racing, Forza , Crackdown, Dead or Alive, Mass Effect, Lost Odyssey, etc. I could go on and on naming great games, but there are two that we feel that deserve to be mentioned above the rest. The first title came out originally for the first Xbox, created by gaming Guru Peter Molyneux and developed Lionhead Studios. Fable redefined the way we think of RPGs on consoles. While the original didn’t live up to the enormous hype that Peter Molyneux was giving it, it sill enjoyed critical and commercial success. Some websites named it Game of the Year in 2004, and the game sold over 2.5 million units on the original Xbox. Fable 2 followed on the 360, and was one of Microsoft’s big holiday blockbusters of 2008. Lionhead built on the success of the original, added the infamous features that were lacking from original and created another fantastic RPG that has gone on to once again surpass the 2.5 million mark. Coming seconded is a game that is so brutal it has chainsaws attached to guns, so brutal that you stomp on enemies to finish them off, so brutal that you stick grenades to enemies and watch them explode into tiny blood-soaked pieces. This game is of course Gears of War. The original boasted the best graphics of the curret console generation when it was released in 2006. Developed by Epic Games, Gears of War single-handily boosted Xbox 360 sales twofold, and has since sold over 5 million units worldwide. It showed gamers the true power of the Xbox 360 and even topped Halo 2 as the most-played Xbox Live title. Many believe that the Xbox 360 is where it is today thanks to this game. The sequel, another big holiday 2008 title, went on to eclipse the first in size and sale, cementing itself as one of the 360’s premier titles. The Gears of War franchise is very important for the future of Microsoft’s games division, but it doesn’t hold a candle next to MS’s most important game, franchise, and hell, call it religion (to some). This juggernaut is called Halo. Developed by Bungie, first-person shooter experts, Halo redefined console shooters, paving the way for many, many more shooters on all consoles. Due to the success of the first, Halo 2 received a massive amount of advertising and brought along online multiplayer that is still being played to this very day. With over 8 million units sold, Halo 2 was enormous. Everyone was talking about it, everyone was playing it online, and in fact over 500 million games of Halo 2 have been played to this day, but nothing could have prepared gamers for the third and final chapter in the Master Chief story. The amount of hype that surrounded Halo 3 was unprecedented. The whole world waited to see if Halo 3 would be the greatest game of all time. Well it wasn’t the best game of all time, but it did rock. Even my grandmother knew about Halo 3; she is one of those old-fashioned types that think video games are a waste of time, but even she asked if I was getting Halo 3. Come on! That’s my bloody 84-year-old grandma, and goes to show how big this launch was! Prior to release, you couldn’t turn on the TV without Halo being mentioned, you couldn’t open a magazine without Halo mentioned, you couldn’t turn on the radio and not hear Halo being mentioned. The launch was just unprecedented. You couldn’t even get a bloody drink without Halo 3 plastered all over the can. No other game in history caused this much attention for a single console. It broke many entertainment records upon release and has since gone on to sell close to 9 million units. It boosted Xbox 360 sales to over 500,000 in the US alone for the month of the launch. You think Xbox, you think Halo; you think Halo, you think Xbox, it’s that simple. Its soundtrack is legendary, spawning soundtracks that still sell very well on their own. The Halo brand has been described by Microsoft as the company’s Star Wars. There have been action figures, books, comics, board games, music, and even fancy dress costumes. Halo has become a culture that has grasped many people, and is something that we won’t see again for a long time. Halo 3 may have been the last chapter in the story, but that doesn’t mean it’s the last you will hear of Halo. Halo Wars from Ensemble Studios looks like it will finally break the RTS console curse, Halo ODST will be Bungie’s final addition to the series, and then we have the mysterious Halo: Chronicles from Peter Jackson that we have yet to see anything about. To put it simply, Microsoft relies on the Halo name to push consoles and has a studio that’s dedicated just for Halo; it’s the mother of all "killer apps." 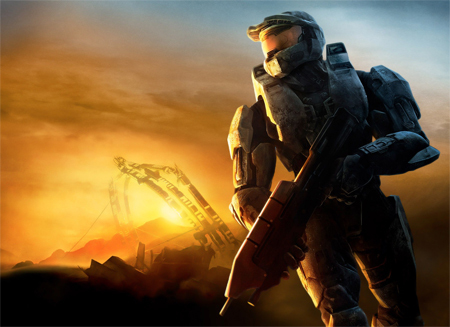 Will we see another full-fledged Halo game for the 360? I doubt it, but expect Halo 4 for the next Xbox console. Halo is Microsoft’s most important title, where would they be without it?